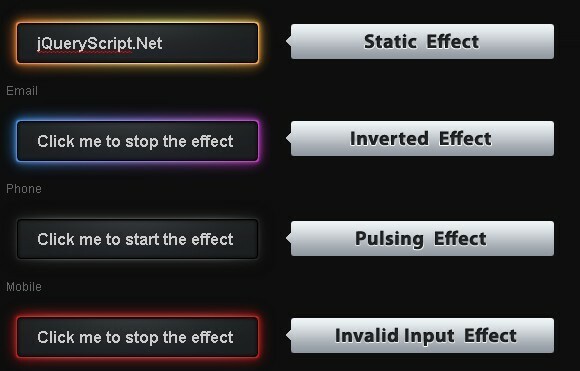 All the Free jQuery Plugins about 'input' are listed here. keypad is a simple jQuery plugin that adds a customizable virtual keyboard next to your input field when focused on. Long Press is a jQuery plugin that make it as simple as possible to insert accented or rare characters on any device like iOS and Android. 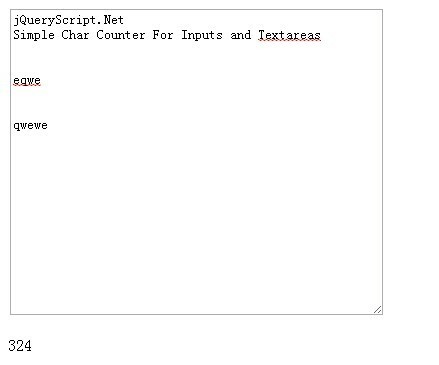 highlighttextarea is a jQuery plugin used to highlight text (words, sentences, strings, etc...) defined in a JS array object for your text fields like textarea and input. Alphanum is a small yet useful JQuery plugin that allows you to restrict a text field to only accept specify characters (alphabetic, numeric or alphanumeric characters). ezdz is an easy-to-use jQuery File Input plugin for creating a drag & drop zone that allows the visitor to drag and drop multiple files into the file input. 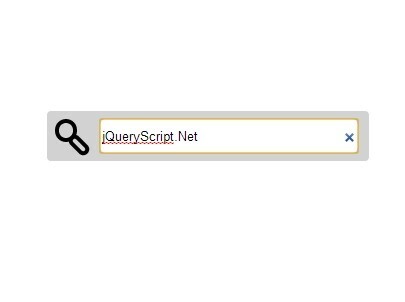 jQuery Search Input is a fancy and user-friendly jQuery plugin that turns the standard html input field into HTML5 search input field. jQuery hideShowPassword is a cross-browser and touch-friendly jQuery plugin that allows your user to toggle password field text visibility on click. 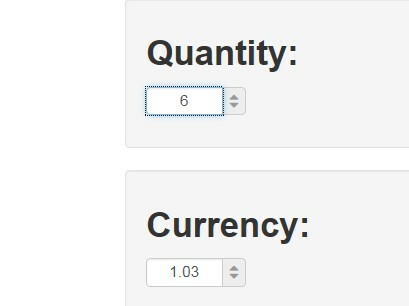 maskmoney is a super simple jQuery plugin that make it easy to mask input filed text in the form of currency. autofill is a fast, easy and useful jQuery plugin that automatically copy and fill out text input fields from another text input fields. 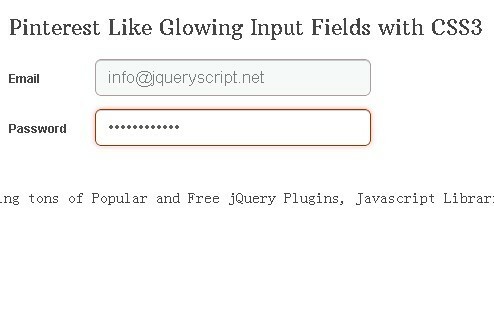 Fancy Input is an amazing jQuery form plugin that adds fancy CSS3 effects to your input fields when users typing in. textrange is a jQuery text control plugin that allows you select a range of text in input field and textarea and replace the selected text with given text. 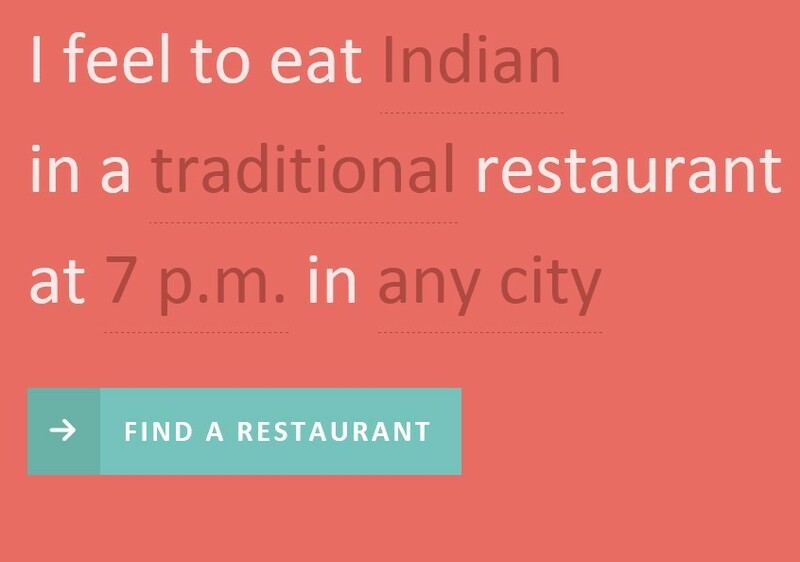 floatlabels.js is a jQuery plugin to create an animated text label floating within the input text field when the user starts typing, inspired by Matt D. Smith's float label concept. Tipue Drop is a simple jQuery plugin that automagically provides custom suggestions as you type into the search box. Phoenix is a human-friendly jQuery form plugin that makes use of HTML5 Web Storage API to save form values your users input into local storage and restore the data when needed. number.js is a jQuery plugin that easily converts input elements your users input in the correct format for further using. autotab is an useful and human-friendly jQuery plugin that automatically set focus to the next form field once the length of the field has reached the maxlength. fancy-fields is a jQuery and jQuery UI based plugin that allows you to beautify/custom your html form elements like input, text field, select list, checkbox, radio button, etc. Input-O-Saurus Text is an input field enhancement plugin that makes use of jQuery and jQuery that allows a text input field to have multiple values. ghostInput is a simple jQuery plugin for creating a custom text suffix (like a sub domain name) appending to the entering text in the input field. MeioMask is a powerful and useful jQuery plugin for creating customizable Input Masks that allow you to control how data being entered into your text input fields is formatted. 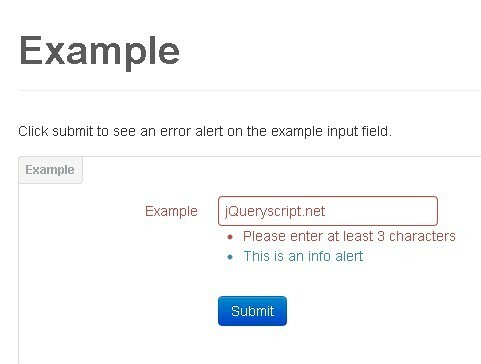 FormHelp is a small yet useful jQuery plugin that provides contextual help on input fields in a standard html form. The NumBox jQuery Plugin helps ensure that a numeric keyboard will pop-up on mobile devices when a number is entered. Stepper is a simple and cross-browser jQuery plugin for number input fields, which will will automatically detect the minimum, maximum and increment values based on the min, max and step attributes. Fitput is a jQuery plugin designed for responsive layout that automatically resize your input and select elements to adapt any screen size. Liquid Input is a small and user friendly jQuery plugin used to resize the text size of an input field based on the filled content you input. 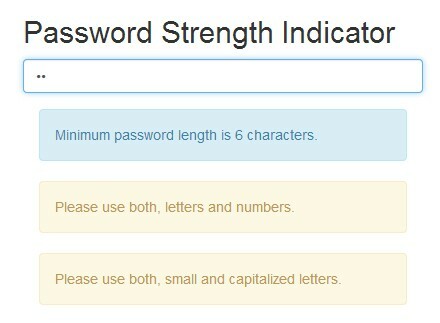 mobilePassword is a jQuery plugin used to show the last character of password in plain text while typing. 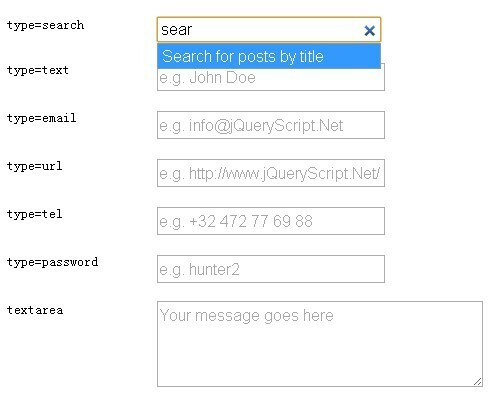 In the post we're going to create an animated search bar that will expand to a search input when focused and collapse to a search icon when lose focus, based on jQuery and CSS3 transform. Expandable Input is a minimal jQuery plugin to smoothly expand the width of a input filed when focused/clicked and collapse it when lose focus. jQuery.placeholder is an useful jQuery plugin that adds a default value to an empty input field for All Browsers. FileInput is a jQuery input replacement intended to style and customize the button and input filed of the standard input type="file" elements. 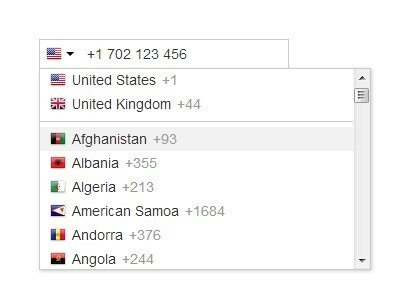 multifilter is a lightweight (~2kb) and user-friendly jQuery plugin that enables you to filter table data using jQuery and multiple input fields. 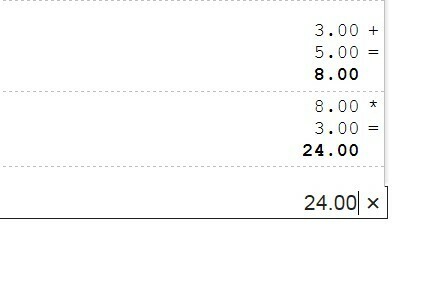 LabelinPlace is a simple fully customizable form enhancement plugin for in-field label support. 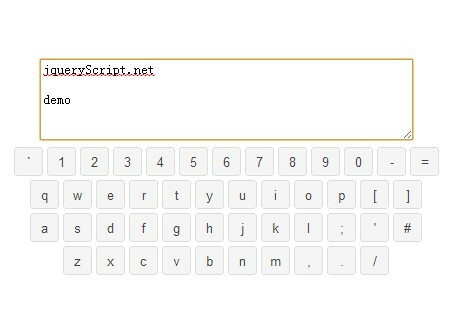 jkeyboard is a lightweight and cross-browser jQuery plugin that attaches a virtual keyboard to the text input or textarea when typing. Duplicate is a jQuery plugin which allows you to dynamically add or remove html elements (e.g. 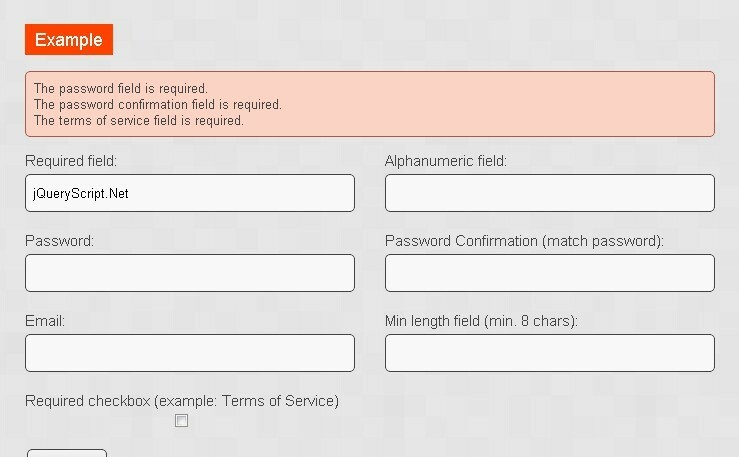 Form Input Fields) when needed, by using data-* attributes. A simple jQuery plugin that applies an IP Address input mask on the text field to help your users with the IPv4 or IPv6 addresses input by ensuring a predefined format. 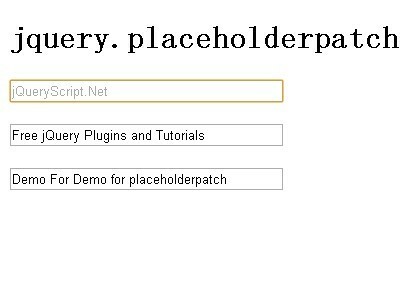 placeholderpatch is a jQuery plugin that enables Older Browsers to support HTML5 Placeholder attribute. A smart and dynamic plugin for jQuery and Zepto that creates an animated underline in an input field to indicate the current cursor position and how much text is occupying it. formatter.js is an useful and flexible jQuery plugin used to format user input to match a specified pattern with custom formatted characters. jQuery autoclear is a simple yet user-friendly jQuery plugin that automatically clear input (or textarea) field values on focus (or click). Calculadora is an useful yet lightweight jQuery plugin that turns an number input field into a inline calculator to make some simple calculations using keypad keys. powerRanger is a jQuery plugin that automatically resize number inputs based on the length of characters. rgbHex is a simple and smart jQuery plugin that converts colors from HEX to RGB and RGB values to hexadecimal code. 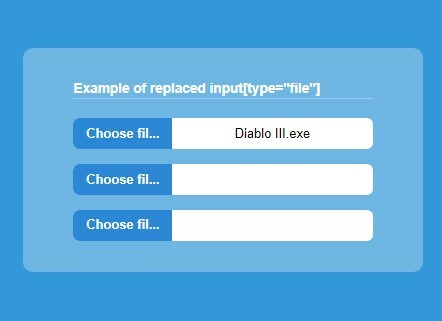 Coolinput is a lightweight jQuery input hint plugin that adds a default value to the input filed with a lot of custom options, mimics html5 placeholder attribute for old browsers like IE7, IE8, etc. 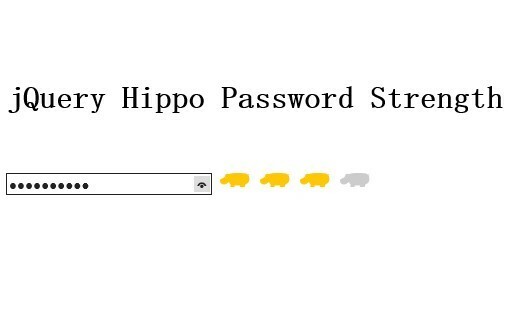 Hippo Password Strength is a fancy jQuery plugin that checks and indicates the strength level of password user input using custom images. 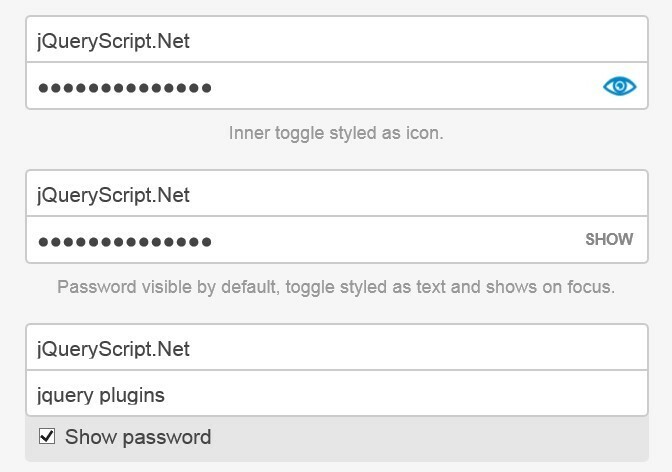 Auto Hide Input is a jQuery form security plugin that auto hide the information entered by the user when the input field's focus is lost, just as the password input type. 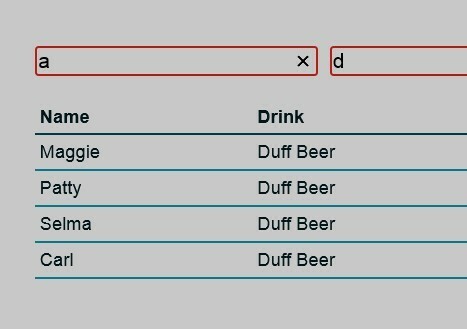 Table Filter is an extremely simple and lightweight jQuery plugin that automatically generates an input field to filter table rows. Nice File Input is a lightweight and clean jQuery plugin for styling the standard html file input filed with some useful options. jQuery TextClear is a simple jQuery plugin that add a close image on the extreme right corner of the input field to clear out the text, as like as provided in Internet Explorer 10. In this tutorial written by MARY LOU we're going to create a Fluid and Mobile-Friendly Search Bar that can be opened on click. Handsome is a lightweight jQuery plugin that makes your default html form elements handsome. It currently supports custom check box, radio button or select drop down list styling. multifile is a simple jQuery plugin for creating multiple file inputs which allows to select more than one files from different directories at a time for uploading. NumericInput is a simple jQuery plugin that makes your input field or textarea only accept numbers as entering. clearme is an useful and user-friendly jQuery plugin that clears the text field once on first click and returns the initial value if it loses focus and if field is empty. clearsearch is a simple and fast jQuery plugin that adds a close button within the input field to allow your to quickly clear the value your user input. MomboBox is a jQuery plugin that attaches a select drop down list with preset items to your input box when focused on. Remember State is an user-friendly and fast jQuery plugin that allows your users to restore they previously entered values in a form using localStorage. Date Entry is a jQuery time plugin similar to jQuery Time Entry that enables your input field to accept date/month/year values using a spinner or the keyboard. 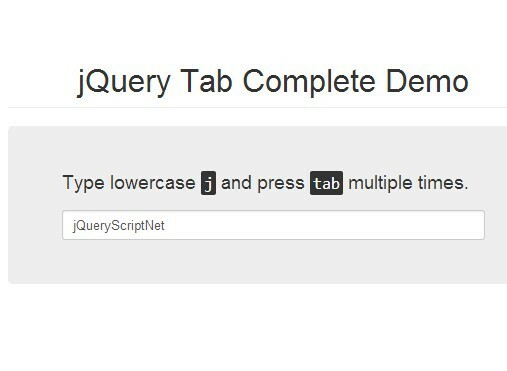 Time Entry is a jQuery time plugin that enables your input field to accept a time value using a spinner or the keyboard. Custom Forms is a fast and lightweight jQuery Plugin that helps you create accessible and beautiful custom form elements like select, input, radio and check box on your website. A simple but useful jQuery form plugin that allows using UP and Down arrows to increase or decrease the values within the Input fields your users type. html5form is a versatile and fast jQuery Form plugin that easily implements HTML5 form verification functionalitys to your form elements. Custom Combo Box is a lightweight and useful jQuery plugin that allows your users to add custom values to dropdown list according to their practical requirements. 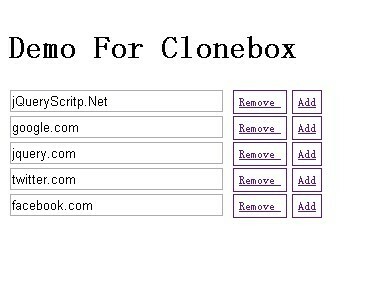 clonebox is a simple but useful jQuery plugin that clone input boxes easily with add/remove button. Living Form is a jQuery Plugin that enables you to create special forms that are guaranteed to impress you visitors. 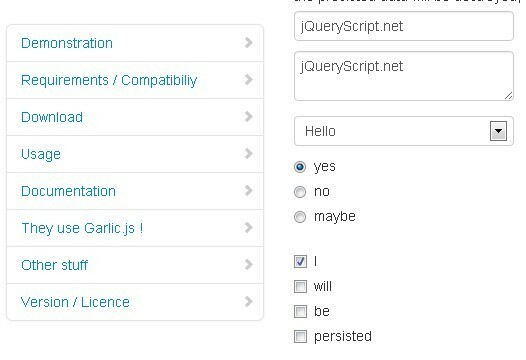 Garlic is an useful jQuery Plugin that helps your users don't lose any precious data type in the form's text field if they accidentally close their tab or browser. 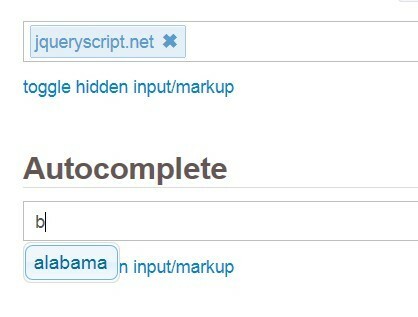 AutoSuggest is a lightweight (~6KB Packed) and useful jQuery Plugin that makes it easy to add Auto-Completing functionality to your project. It will dynamically create all the HTML elements that it needs to function.